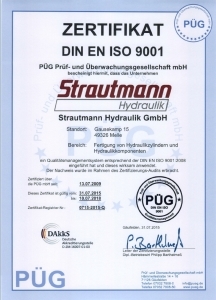 Home/Certificate/Strautmann Hydraulik & Zerspanungstechnik were certified for another three years! 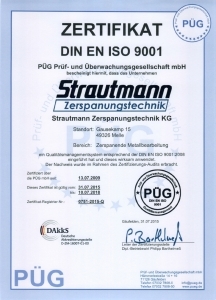 On 09th and 10th July the company Strautmann Hydraulik GmbH und Strautmann Zerspanungstechnik KG have been successfully recertified according to the DIN EN ISO 9001:2008 through the testing and inspection company ( PÜG ). The validity of the new certificate is 3 years. As early as next year, we will begin the new requirements of the current revision take it into account in our management system.